Every classic cocktail has a story, it's recorded somewhere to be found. Although there is not a definition for “Classic Cocktail”, a timeless recipe that travels outside of the bar where it was created, continues to be ordered elsewhere by its name and is highly regarded by other bartenders are all qualities for a drink to be considered a classic cocktail. Their recipes are usually simple and memorable. Jungle Bird is just such a cocktail, a drink created in Malaysia which you can order in cocktail bars around the world, where the bartender would be able to mix one up with ingredients they have on their rack. Even though they may not have the exact ingredients, the essence of the cocktail comprising these 5 ingredients will be used: dark rum, fresh pineapple juice, fresh lime juice, syrup and Campari. This modern classic cocktail was first recorded in The New American Bartender’s Guide by John J. Poister published in 1998, stating that the cocktail was created in the Kuala Lumpur Hilton in 1978. I’ll come back to the error of the date later. The recipe was picked up by a famous bartender and drinks writer, Jeff Berry a.k.a. Beachbum Berry, and published in his cocktail book Intoxica! (2002), then again in his Beachbum Berry Remixed (2009), bringing attention back to the cocktail. The Jungle Bird is considered a “tiki” style cocktail. These are generally rum-based, sweet and fruity, and are meant to be light and refreshing. Tiki cocktails are derived from the tiki culture created when Don The Beachcomber opened a restaurant in 1933 in Los Angeles. The Polynesian-style restaurant served cocktails using tropical fruits in mugs carved with wooden Polynesian god statues. What made the Jungle Bird stand out was the unusual addition of Campari, an Italian amaro, or bitter herbal liqueur, traditionally served as a digestif. The amaro gave an extra bittersweet dimension and balance to the generally sweet tropical fruitiness of the drink, and a kick in the end with its herbal bitterness. This combination of sweet, fruity, bitter made the Jungle Bird a favourite for many bartenders, both to serve as well as for personal consumption. According to the article in Punch by Kara Newman, Giuseppe González adjusted the recipe by reducing the pineapple juice from 4oz (120ml) to 1 ½ oz (45ml), and swapped Beachbum Berry’s recorded Jamaican rum to blackstrap rum for the menu at the then famous urban tiki bar Painkiller/PKNY in 2010. The adjustments are said to have brought out more prominent flavours of the rum and Campari. Many Malaysian bartenders have asked who the real creator was for this world-renowned classic cocktail with Malaysia’s name marked on it. The biggest question was whether the creator was Malaysian or a foreigner. This question is not without merit, cocktails were part of western culture, and the creation of such a sophisticated recipe could mean a trained palate and good knowledge for mixed drinks. I was determined to find the answer. “The drink (Jungle Bird) was created as a welcome cocktail for the hotel,” said David Hong, who worked for the wine section in the opening team of Kuala Lumpur Hilton. The first five-star hotel in Malaysia opened on 6th July 1973 on Jalan Sultan Ismail, so the drink would have been created before that date. This conflicts with Poister's account which recorded that as 1978. 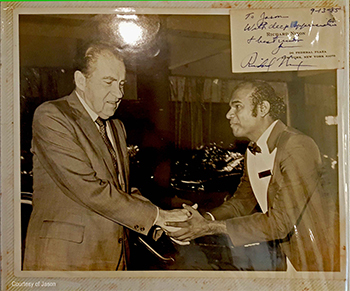 The hotel hosted the most important meetings in Malaysia at the time, including foreign dignitaries and royalty such as South African President Nelson Mandela, U.K. Prime Minister Margaret Thatcher, U.S. President Richard Nixon, and Queen Elizabeth. It could be that Poister learned about the recipe from his travel years after the hotel was opened, or perhaps from an acquaintance who had. “The management wanted a tropical themed cocktail as the signature for all the F&B outlets in the hotel. Six recipes were created based on ‘creative creation’ (as in freehand, or now referred to as twist) from the classics. The Jungle Bird recipe (before it was named) was chosen to be the welcome drink,” recalled Hong. The Jungle Bird was served to guests upon their arrival at the hotel’s lobby lounge, The Aviary Cocktail Lounge (previously reported as Aviary Bar until a match box from the lounge was pictured - 1 March 2019), till the last day of the hotel’s service on 2nd January 2013, when the hotel was eventually demolished for redevelopment. The other F&B outlets in the hotel were The Planter’s Inn, Tin Mine, Melaka Grill, Inn of Happiness and The Paddock, each of which had their own signature tropical themed cocktail on their menus. 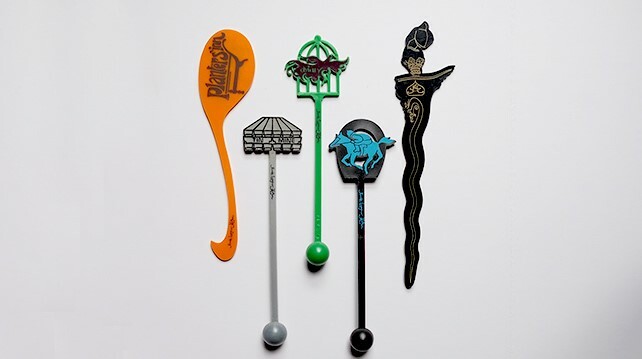 Stirrers from the Kuala Lumpur Hilton’s F&B outlets. From left: Planter’s Inn, Tin Mine, Aviary Cocktail Lounge, The Paddock and Melaka Grill. After publishing my first issue of Thirst Magazine in 2017, making Jungle Bird the cover feature of the launch issue, I received leads from numerous sources, some getting me closer to the answers I was looking for, some with more entertaining stories. I was introduced to Jason (real name Pirabakaran Arumugan), a butler for Kuala Lumpur Hilton since its inception till its closing. According to Jason, Muhammad Ali stayed at KL Hilton in 1975 for his match with Joe Bugner. During his stay, he was looked after by another butler, whom the boxer later offered a job and brought to the U.S. with him. “He left for America and worked for Muhammad Ali for one year,” said Jason. Whilst Ali didn’t drink alcohol, it could be that the welcome drink came up during conversations with various people in the U.S. However, this theory still doesn’t match up for the creation date in Poister’s book. My deduction would be that Poister have recorded it as 1973 but mis read it for 1978 when put into his book published in 1998. 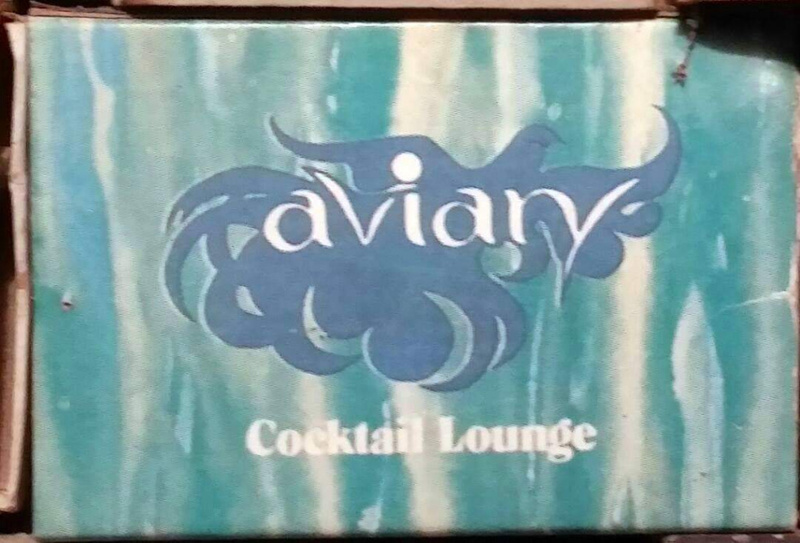 The Aviary Cocktail Lounge, named by the first F&B Director of the hotel, Reinhard Steffen, faced the swimming pool, with a glass panel separating the bar and the poolside which allowed guests to see the exotic birds kept in the netted aviary by the pool. The name Jungle Bird was given to the cocktail as a reference to the birds. The glassware was described by Hamid Harun, one of the bartenders in the opening team, as “a stemmed wine goblet with an engraved bird on the side of the brown and greenish porcelain glassware”. The glassware used for serving the Jungle Bird drink were sent for auction like the rest of the items in the hotel, but went missing from the pile. Unfortunately, I have had no luck in getting a picture of the said glassware. I connected to a Facebook group that was created to remember Tin Mine Discotheque in the Kuala Lumpur Hilton. My story about the Jungle Bird cocktail started to receive responses thanks to the moderator, Min Kak, who posted up questions on the page. Members of the community responded to the post and I got hold of the bar men who worked in the opening team of the hotel. One of them was Hamid Harun, who confirmed that the then Beverage Manager, Jeffrey Ong created the cocktail. The crew at the opening of Kuala Lumpur Hilton dated 23 December 1972: 1. Bala 2.Leong 3. Ngiam 4. Hamid Harun 5. Jeffrey Ong. There was some speculation that it was the F&B Director, Steffen, who created the classic. This theory was dismissed when Hong revealed that Steffen was a chef, not a bartender. I called Hamid to find out more about Jeffrey Ong and he told me the last he saw of him was in Penang. That was more than a decade ago. Without Ong’s full name, I was unable to move forward, but not for long. 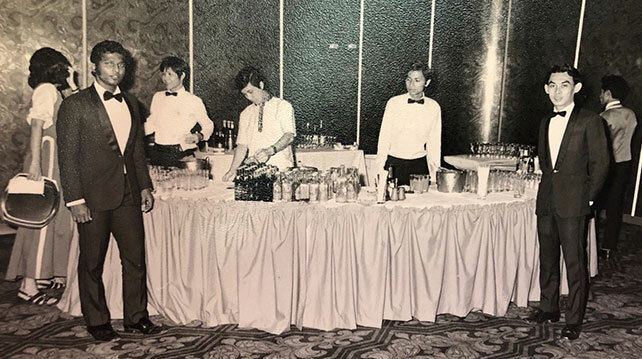 Jeffrey Ong on the far right posing during a function in KL Hilton, circa 1973. By chance over whisky, I met the Chief Executive Officer for the Malaysian Association of Hotels, Yap Lip Seng. I told him about my research on the Jungle Bird cocktail and the progress I had made so far. I had a name and the last place of work for Jeffrey Ong, could he help? From then, it wasn't long before we found Ong. His full name is Ong Swee Teik, born in Penang on 10th August 1948. Ong stayed with Kuala Lumpur Hilton for 2 years then went to work for Shangri-La’s Rasa Sayang Resort in Penang as Bar Supervisor, to be closer to his family. There, he created a signature welcome drink for the resort called ‘Asmara’ with a similar recipe to the Jungle Bird cocktail. The exact recipe was provided to me by Andrew Charles, the restaurant director up till 2004. The drink was still on the menu when he left his job in the resort. The likeness of the Asmara recipe to the original Jungle Bird’s can be seen in the use of pineapple juice and the addition of bittering agents to the sweet drink. Word travelled to Ong’s family that I was searching for him. His daughter Debbie subsequently got in touch with me and we had a phone conversation. I was excited, finally, I get to meet the creator of the drink that put Malaysia on the classic cocktail map. What was I going to say? What do I tell him when we meet? But I was happy too soon. Debbie told me that Ong was not in a position to communicate due to illness. I missed my chance by a year and Ong shared very little about his work with his family. He’s a discreet man, and protective towards his family, as is his family towards him. Ben Ng (a Penang-ite), a pioneer in the Malaysian bar industry and a strong advocate of local culture, helped to arrange a visit to Ong with his family’s permission. We told Ong about the search for him the past 2 years. His eyes glistened when the name ‘Jungle Bird’ was mentioned, and even without words, we felt his emotion. The pride we felt for him, after 5 decades, to be finally credited and acknowledged for the fame that his creation has brought to the country. Overjoyed, we sat quietly in the room, sharing chit-chat with the family. We found out that Ong was a very quiet, soft-spoken person and doesn’t drink! His wife once asked him, how did he make all those cocktails when he doesn’t drink? He said he used his nose to smell the aromas, and simply tasted the drinks but not fully consume them. Here it is. I wanted to tell the world this story. To straighten the records in all the cocktail books before this and to put a name to the creator of this cocktail, so influential in the revival of the tiki era, twice. First in the 70s, then again 2 years ago with a new wave which is still going strong around the world. Let’s see this Malaysian pride in all the cocktail menus of bars in Malaysia. It’s a story we get to share with our fellow Malaysians and guests in our country.